The human body does not naturally manufacture the essential Omega-3 fatty acids, yet Omega-3 is important for optimal mental and physical health. For this reason, our diet must contain enough Omega-3, whose main source is fish oils. 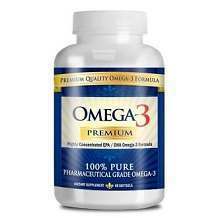 Fish oil capsules can now be used as a quick and easy way to ensure that Omega-3 is present in your daily diet. As a dietary supplement, Omega-3 capsules help boost cardiovascular functioning by reducing the risk of heart disease and strokes, improve cognitive performance, reduce brain tissue inflammation, and also increase the quantity of important neurotransmitters in the brain. Omega-3 fatty acids are made up of EPA (Eicosapentaenoic acid) and DHA (Docosahexaenoic Acid). EPA has been clinically proven to be quite effective in the treatment of attention deficit disorders and hyperactivity. Limitless Supplements Omega-3 capsules are a great way to ensure that you take advantage of the health benefits of Omega-3. The source of this product did not provide any information regarding the recommended daily dose for Limitless Supplements Omega-3. It is packaged in containers that carry 365 softgels each. The price of the product is $26.40 USD. The product vendor is based in New Zealand. The product seller has not made available any information on whether there is a guarantee or return policy attached to the product. However, the product website has a contact page that allows prospective customers to send any questions and comments via email. 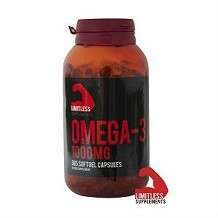 Limitless Supplements Omega-3 is sold through a network of dealers who source the product from New Zealand. Potential clients living in the United States should make a point of getting in touch with the vendor in order to confirm the availability of the product within the US. It is also important to get more information regarding any product guarantees or return policies. Though there is no phone number or mailing address, the product source has provided a tool on their website for customers to send their queries or comments about the product.